I Scream, U Scream . . .
Bend gets a locally-made ice cream! When Ben & Jerry's started making ice cream, flavors came in about three choices—vanilla, chocolate and, for the bold, strawberry. Oh sure, there was the more expansive Baskin Robbins dishing out 32 flavors, but even those were fairly traditional, with variations on chocolate like Rocky Road. But in 1978, two Vermont hippies had a completely original—if not slightly hair-brained idea—to bring ice cream to the people, taking a truck that they drove cross-country, often stopping at college campuses, and with flavors that at the time seemed wild-and-crazy (Cherry Garcia! Cookie Dough! ), but today seem rather tame and expected. Ice cream has come a long way since then, and at the front edge of that trend is a newly launched Bend-based company, Addy Mac's Creamery. On a recent warm afternoon, the owner and ice cream maker Justin Scott stopped by our office with three pints of hand-churned ice creams (the exact type of visitors we welcome). His two daughters, after whom the company is named, flitted around our office. One chimed in that her favorite flavor is "vanilla," while the other went a bit further out on a limb with the slightly more exotic "raspberry." 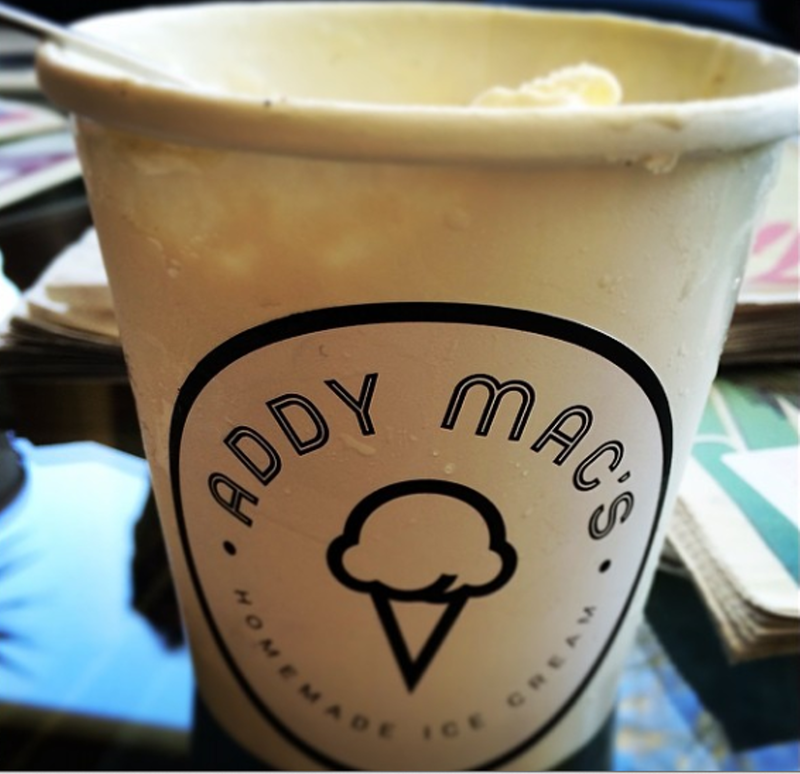 Addy Mac's Creamery, however, produces a line of ice creams much more creative and ambitious. The three flavors that Scott brought for us to sample were: Silver Moon Dark Side Stout, Peanut Butter + Chocolate Ganache and Cardamom. One of our sales staff, drawn out of her cubicle to examine the noise—and sample the ice cream—called the scene "pure happiness." Scott's wife grew up in Central Oregon, and just returned to teach. Meanwhile, Scott grew up with his mom on a farm, southeast from Portland, near Estacada. "I grew up making hand-made ice cream," he said, "and I've always just loved it." Now, he is turning that love into a business. What is most noteworthy about Addy Mac's Creamery is its clever flavors that blend existing and known local flavors; for example, using Backporch coffee beans for one of its many flavors. And, its Cardamom tasted like Sparrow Bakery's popular ocean rolls. "Our whole idea is to be collaborative and innovative," he explained. "How can we take stuff that people love in Bend, and turn it into ice cream?" Two ice cream flavors are already on the menu at Barrio—appropriately, chipotle chocolate and banana bacon. "We're trying to have fun with it, and do some crazy stuff, as well as traditional." Scott is refurbishing a 1960 diary truck, which he plans to use as his mobile shop, scooping at NorthWest Crossing Farmers' Market, Munch 'n' Music during the summer, and each Friday evening at The Lot. 4 pm – 10 pm.